Derek Wright is a long-time student, performer and teacher of music and dance. He has deeply studied Brazilian percussion, Middle Eastern stringed instruments, North Indian classical music, voice, body music, dance accompaniment, and improvisation. Derek Wright has been a musician all of his life. He started his training thanks to a vibrant music program in the public elementary school he attended in Amherst, MA. Growing up in New Orleans, he was a jazz bassist at the New Orleans Center for Creative Arts, a saxophonist, and percussionist. In 1993 he moved to Madison, WI to pursue majors in computer science and physics, and to continue his studies of jazz and bass with Richard Davis. 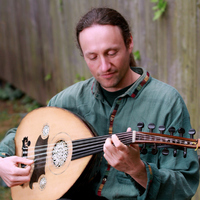 Derek plays a number of stringed and percussion instruments from around the world, especially the oud, saz, Brazilian drums, body music and voice. He has also collaborated with other artists to widen the palette of sounds available. The following sections introduce and explain all of the instruments heard within Derek's music. Derek has always tried to share his knowledge and understanding with others. As with love, friendship, goodwill, and many other beautiful things, the more you share, the more you have. His extensive studies have not only given him a depth of material, technique, grooves and musical approaches from numerous traditions, he has also experienced and learned from a wide variety of teaching styles in difference contexts. Benefitting from the mistakes and successes of numerous teachers around the world has enabled Derek to teach for a vast range of levels and experiences in numerous settings, explain things from many different perspectives, help students see the connections between things, and always work towards enhancing their overall musicianship and presence, regardless of the specific technique employed in each moment. Workshops, master classes, and private lessons are available in many options, including: North Indian classical music; Maracatú; Other rhythms from Pernambuco (Coco, Ciranda); Carioca (Rio-style) Samba; Samba Afro/Reggae; Introduction to Candomblé rhythms; Body music; Non-Western (Sargam) notation (for rhythm, drum arrangements, melodies, dance, etc); Instrument technique and ergonomics (especially stringed and percussion instruments); Breema Bodywork and Self-Breema. DerekWrightMusic.com is proudly built with the Pushtape distribution of Drupal, an open source content management system/framework used by many sites on the Internet with contributors from all over the world. When not making music, practicing Breema, and/or teaching, Derek is a computer scientist, programmer, and project manager. He is known as dww, a prolific contributor to Drupal with many roles over the years, and previously was a senior developer for the HTCondor High-Throughput Computing system at UW-Madison.